Botanical Name: Austromyrtus dulcis (C.T.White) L.S.Sm. The midjem berry, Austromyrtus dulcis, (also known as midyim berry or sand berry) is an easy to grow bushfood which occurs naturally in coastal areas ranging from northern NSW to Fraser Island in Queensland. A favourite with Aboriginal people it has a sweet, but tangy flavour which means it is nice to eat fresh, but also great in pies and preserves. It is a close relative of the Lilly Pilly. Because it hardly suffers from pests and disease, it is a useful plant for gardeners who want to minimise their environmental impacts by avoiding chemicals sprays and fertilisers. 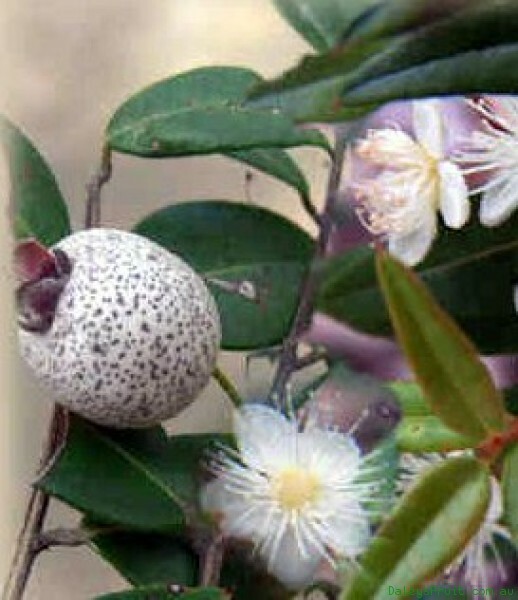 There are at least eleven species of Austromyrtus endemic to Australia, the majority occurring on the east coast from central New South Wales to northern Queensland. They are small trees or shrubs and can be found in woodlands, heath, forests or rainforest fringes. Midjem is able to grow to almost 2 metres in its natural habitat of mild rainforest gullies, it is, however, mostly grown as a low shrub about 1m tall and 80cm wide. It can be also be useful as a low hedge. The leaves of Austromyrtus dulcis are an attractive burgundy colour when young, then turn dark green. They are arranged in opposite rows and the under-surface has a dense covering of hairs giving it a pale, silky appearance. The midjem berry grows in full sun or part shade, growing densely to about 40 cm in full sun and as a more open ground cover if planted in the shade. In climates outside its natural range, it is best located under some overhanging tree branches to give some protection from frost. It will grow well in sandy coastal conditions as long as it is protected from harsh, salt-laden winds. It handles a range of soils and will thrive in garden soils as long as there is good drainage but adequate moisture. So that means thorough mulching in summer to prevent drying out. The flowers are 7-10mm wide with white ovate petals. In its natural habitat, flowers appear in spring and summer, while in cooler places, like Canberra, the flowering time is summer to mid-autumn. The flowers are 7-1 0 mm in diameter and have white ovate petals. They are usually borne in clusters of 2-5 flowers in the upper axils, although solitary flowers are also common. Harvesting time for the sweet berries, which some say have a gingery taste, is late summer and autumn. They are best eaten straight from the bush. The fruits are berries containing 3-9 pale brown seeds. The berries are white with small blue-black spots which give them a mauve or grey appearance. The berries are considered bush lollies by Arakwal Elders. The midjem berry appears to be relatively free from pests and diseases. However, as a member of the Myrtaceae family, it is at some risk from myrtle rust. This disease attacks young leaves, shoot tips and young stems as well as fruits and flowers. The first sign of myrtle rust infection is tiny raised spots that are brown to grey. Up to 14 days after infection the spots produce masses of distinctive yellow/orange spots. If you think you may have myrtle rust, contact authorities in your state. Able to make an attractive hedge the midgen berry can be pruned to any shape. It is relatively easy to propagate. Fresh cleaned seed germinates in 3-4 weeks while uncleaned fruits take a little longer. Although the outer coat of the seed is hard, no scarification (breaking or scratching) is necessary. Propagation from cuttings is also easy. The fruit is best eaten fresh, seeds and all, but can be added to fruit salads, pies or made into jam. Some say it has a flavour that is like a blueberry with a hint of eucalyptus. The midjem berry is sold around the country in nurseries which specialise in native bushfood. It can sometimes be sourced online. Native edible plants are a useful wild-life friendly alternative to the usual fruits and vegetables we plant in our backyards. Native species do not need fertilisers, which reduces the pressure of nutrient loading on nearby waterways. Planting native plants in our backyards is one way to reduce the use of exotic species and help protect native species from extinction. Peel, core, and finely slice apples. Lay out pastry sheets and place apple slices down the centre. Sprinkle apples with midyim berries. Cut small pieces of butter and sprinkle on fruit, and then sprinkle with sugar, reserving 1 teaspoon for the glaze. Cut pastry on slant in strips about 1cm wide up to apple. Starting at one end, overlap strips in a plait pattern wrapping over the top of the fruit. Place on a baking sheet and bake in oven at 200ºC until starts to brown. Remove from oven. Mix milk and teaspoon of sugar and brush on top of pastry to glaze. Place back in oven to finish browning. Serve with fresh cream or custard. It can be used as a substitute in other berry jam recipes or mixed with other berries.